New Zealand’s Quota Management System (QMS), based on Individual Transferable Quotas (ITQs), has for a number of years figured as either ‘heaven’ or ‘hell’ in the fisheries debate. For most economists the ITQ-system has been presented as the solution to inefficient state management, while many social scientists and biologists have considered the system as a recipe for uneven distribution, regional dislocations and unsustainable yields. A steady flow of ‘missionaries’ were eager to promote or prevent the introduction of ITQ-based systems in other countries. But what is the evidence? 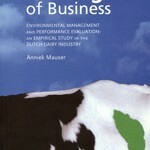 Has the QMS delivered according to the promises of economic efficiency, biological sustainability and reduced management costs? Unfinished Business tries to bring a balanced account of the first 15 years of the QMS, highlighting both its merits and shortcomings. 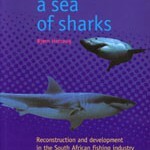 As such it is a relevant contribution to the debates on fisheries management, co-management and stakeholder participation. 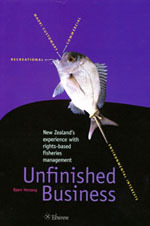 The book is also the first attempt of giving a coherent presentation of the New Zealand management system, from the start to the present times, covering all important stakeholder groups and should be of interest for academics as well as administrators, being involved in right-based fisheries management.